At UFIT, uniqueness is celebrated through an uncommon passion for those with special neurological, developmental or physical needs. We believe that everyone deserves to experience optimal levels of health and fitness that lead to greater independence, personal growth and lifelong health. We customize fitness training based upon each person’s unique interests, needs, abilities and level of fitness. UFIT was created to provide a fun, high-quality fitness experience where the differently-abled can thrive. We help our clients achieve optimal results with guidance, goal setting and personal encouragement. We dish out lots of positive reinforcement, and celebrate every milestone. We utilize a proprietary visual training system that uses visual cueing and demonstration. This allows our clients to experience greater independence, while improving comprehension and learning. “Peggy has really helped change Sophie’s life! Sophie is becoming stronger physically, but also mentally... The encouragement and training are second to none. We couldn’t be happier with Peggy and the work she is doing.” – Jason G.
Our mission is to provide a fitness center dedicated to helping unique individuals achieve optimal levels of health and fitness for life in an environment designed to meet their needs. Our goal is to help make fitness a way of life by combining a safe, inclusive environment with highly trained fitness professionals. At UFIT, we help others grow strong, healthy and independent. Choose from Personal Training with a Certified Trainer or Group Training. Or, choose a Fitness Class including Strength Training, Core Fitness, Running Program, Race Training, or Dance Class. For more information, membership options and pricing visit our programs page. “Peggy is a very knowledgeable personal trainer to many special needs individuals. My daughter Kristin has been working with her since May of 2017 with amazing results…” - Kathy B. JOIN – Become a UFIT Member - We offer a variety of membership options. Add personal training or classes. CONTACT US to learn more. VOLUNTEER – Become a UFIT volunteer. Ask us how! SPONSOR – Sponsor a friend or neighbor. Ask us how! SHARE – Know someone who needs UFIT? Tell a friend! Founder and Certified Personal Trainer Peggy Mills has dedicated nearly 30 years to fitness training and education, including 20 years as an Adapted Physical Education teacher serving children with developmental and neurological challenges. As a certified Corrective Exercise Specialist through the National Academy of Sports Medicine (NASM) and with her Autism Fitness Level 1 Certificate through Autism Fitness, her specialized experience includes service to those with Autism and Asperger’s syndrome, Down syndrome, Cerebral Palsy and more. 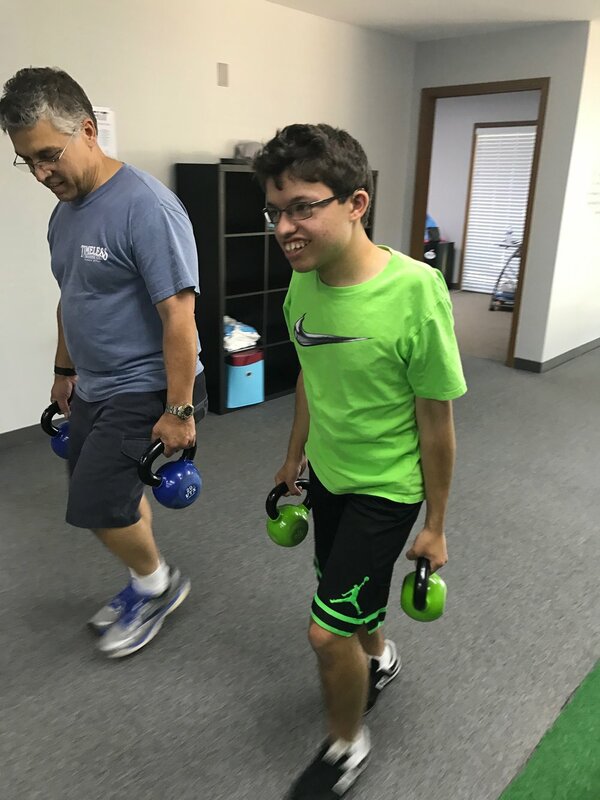 UFIT was established as a faith response to the growing need for specialized fitness training within the special needs community. UFIT Dublin in the NEWS! Check out the latest news as featured by NBC4, ABC6, Columbus Monthly, Columbus Underground, The Columbus Dispatch and more.